I recently had a rather erm, charged conversation with a girl I like who happens to have a very acute sense of smell. She remembers my first two cars, both of which outdated us, either by months or years. And they both had an old-car smell about them. She said to me, "Suddenly, I can't get the smell of car parts out of my nose." My Dodge is at this point eight years old, and it's developed its own sort of old-car smell to it. And there's something about that that's homey to me. My uncle's Volvo 340 that smelled like cigarettes and old rain, for example. Or my grandparents' '62 Catalina Safari that had never quite recovered from the outgassing of the vinyl, so meticulously was it maintained. 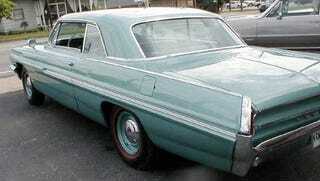 Or my '70 Buick, which smelled like cigarettes, old vinyl and rain. Except for the three weeks after the cigarette lighter melted the dash plastic while it was parked. That was a tad gnarly, frankly. An engine bay doesn't smell like an engine bay until there's a sufficient amount of oil on the block. There's an essence of scent that hangs in the metal of the best-restored hot rods and classics. Bumbeck's Starlet reminds me of my high-school friends' hand-me-down Japanese cars. Last night, Dubspeed's Kasey Kagawa and I went down to Long Beach to see a show in his '70 El Camino. When it rains, like every GM A-Body ever built, it leaks. And it had rained. And as a result, the windshield steamed up. And the musty smell of that ElCo was a bit of nostalgic heaven to me. Although I admit I was slightly afraid Kasey was going to run us into something until the front glass cleared up. It may be irrational; but I like that older cars seem to smell of industry, ingenuity and sweat, while newer cars smell like aphrodisiacs crafted by Cray mainframes for IBM PCjrs. I suppose, someday, people will hanker for the scent of a 2007 Camry, as nothing inspires memory as much as scent, but at the same time, I have to wonder why. Volvo 140 Cars, Rockin&apos; Yer Face!